Save money on fuel! – This 3-inch ethanol still will make up to 5 gallons (19 litres) per hour of high-proof alcohol fuel, ready to use. Your car will run faster, cooler, and better on ethanol. It's easy to make your own top-quality fuel, and it's cheap – as little as $1.20 per gallon (32¢ per litre) or even less. Anyone with basic backyard DIY skills can build the still. 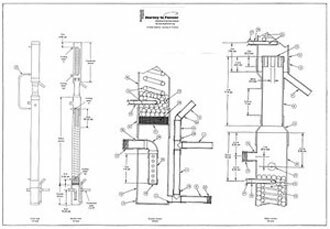 A new large-size blueprint shows the sections of the still in full-sized cut-away detail, and the clear and simple, step-by-step instructions in the manual tell you everything you need to know to build the still and operate it. 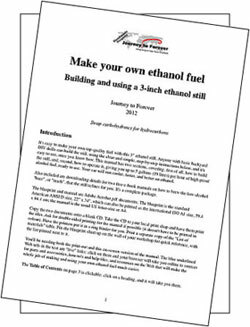 Included are details on applying for a free "small fuel producer" permit from the US Alcohol and Tobacco Tax and Trade Bureau (TTB) which allows you to make up to 10,000 gallons (38,000 litres) of ethanol fuel at home for personal use per year. Other countries have similar rules. Contact the national authority in your country and find out what's required. Also in the manual are downloading details for two free e-books on how to brew the low-alcohol "beer", or "mash", that the still refines for you. The raw material is starch crops like corn, wheat and other grains, starchy root crops like potatoes or sweet potatoes, including spoiled crops, or sugar crops like sugarcane, sugar beet, fruit (including spoiled fruit), and food wastes (from a bakery, for example). The two free e-book manuals tell you how to deal with all the different feedstocks. The still is a tried-and-trusted design that dates back to 1980, following the 1979 oil shock, when the price of Texas crude oil shot up by 250%. The long lines waiting at gas stations kindled widespread interest in fuel independence, and especially in alternative fuels that you could make yourself. Journey to Forever bought the whole 3-inch still project some years ago. Many improvements have been made since 1980. This is the latest version. The blueprint and manual are Adobe Acrobat pdf documents. The blueprint is the standard American ANSI D size, 22" x 34", which can also be printed as the international ISO A1 size, 59.4 x 84.1 cm. The 41-page e-book manual is the usual US letter-size or A4. The two documents are combined in a single Zip file named still.zip. To unzip the file, double-click on it, and then click Extract on the shortcut menu. For Macs, just double-click on the zip file. To buy the book, click on the "Buy Now" button below. You will be taken to PayPal, where you can pay by PayPal or by credit card or debit card. When you have paid, you will be shown a link back to Journey to Forever. Click on the link. This is the Download page. Click on the "Download" button - the book will download to your hard disk.